Click the image below to view the latest Rental Equipment catalog from Morgan City Rentals. This e-version will allow all customer access to our extensive inventory of rental equipment from anywhere! Have questions or need a quote? Simply call us or email us today! Want to have a catalog mailed to you? Fill out the form below and our marketing team will mail you one directly. MCR is actively upgrading their rental fleet by listening to our customers' needs, improving our processes, and keeping up with the new regulations being introduced to our industry. 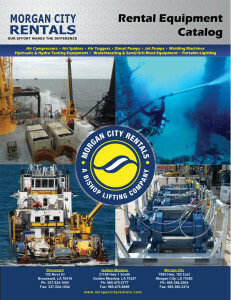 Items in this new catalog include: winches, compressors, pumps, water blasting equipment, air tools, hydraulic tools, and much more. All items are available to rent for short and long term periods.